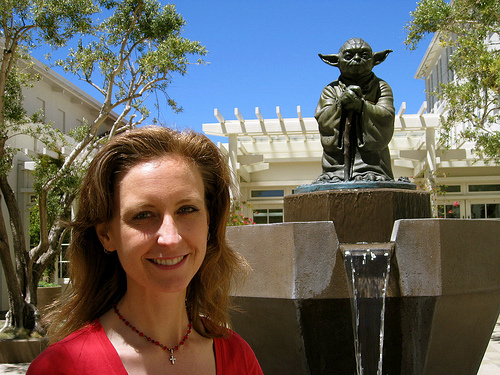 Yoda statue at Lucasfilm! | make. see. eat. do. ← Joe Klein’s “angry, left-wing media” quote of the day! After spending a good chunk of the weekend clearing off the Tivo — finished up watching most of the Olympics and the tail end of both political conventions! Whew! — I am finally getting around to uploading the scads of pictures we took this summer onto our Flickr page. Yay! 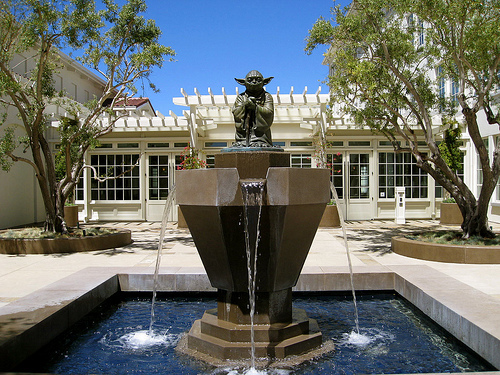 And while sorting through some pics from our weekend jaunt to San Francisco in July, I came across some rocking pictures I took of the crazy-cool Yoda statue outside the Lucasfilm: Letterman Digital Arts Center on the Presidio. Yes, I said Yoda, as in, the baddest Jedi in the galaxy. And yes, there is an actual statue of Degobah’s finest that you can pose in front of if you know how to find it…cool, huh? As luck would have it, Christine and my friend Ginger and I kind of accidentally discovered the statue a couple of years ago. While cruising around San Francisco in Ginger’s sweet ride, the three of us explored the beautifully reimagined Presidio — the place was kind of a ghost town when we lived in SF in the 1990’s — in search of the mythical Yoda statue. It was getting dark, and it was cold and totally foggy, and we were about to give up the search entirely when I spotted an unmarked employee entrance to the Lucasfilm offices near the base of the Presidio. 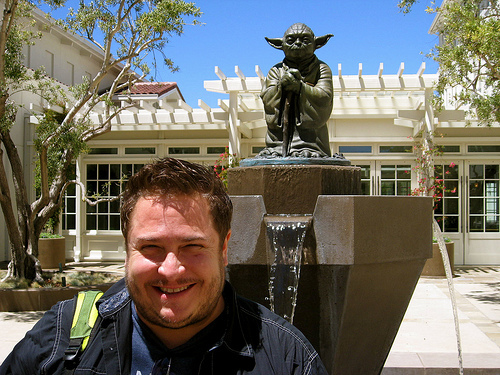 But rather than making a run for the car, being the gigantic goober that I am, I asked him to take a picture of the three of us with Yoda. I know, nerd-tastic! But he was super cool and not only took a picture, but actually invited us inside to see some of the full-scale “Star Wars” models in the lobby. Aside from shelves full of awards, they had a life size statue of both Darth Vader and Boba Fett towering over the couches in the waiting area…I’m not kidding, man, I just about fainted…talk about geek heaven! Sadly, most of those pics we took that day were lost to the ages when my laptop Hal 9000 fried earlier this year. So, this past July, I begged Ginger to drive us over to the Presidio (again!) for some all new pics with Master Yoda. And guess what…she agreed! Thanks, Ginger! 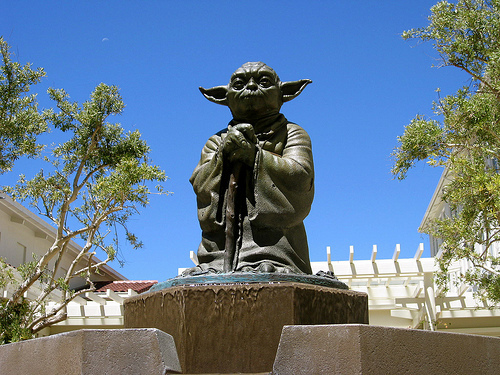 So, here, for your viewing enjoyment are my favorite pics of the amazing Yoda statue/fountain at the Presidio. We didn’t get to go inside this time, but hey, been there, done that. Getting some fresh pics with Yoda was my goal, and as you can see, we picked a perfect day for it! Rock on, Master Yoda! And may the Force be with you…always. Way cool, that statue is. Check that out the next time I’m in the City, I must. OMG, go to this you must…rarer than a sunny day on Degobah this statue is! It was actually the perfect, sunny day to revisit the Presido and Lucasfilm. The Starbucks located on the premises was pretty neat-o as well, with cool posters on the walls and a fun/hip “Hey, I work at Lucasfilm next door” vibe from the patrons.